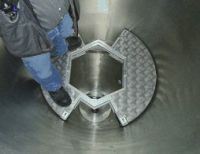 Ever-tighter safety regulations and extensive assembly times of a suitable working platform increase the complexity of work for services in conical process vessels. Urgent repairs often cannot be performed in time as individual carpentry works for the establishment of a platform are delayed, wooden or steel pipe constructions are not allowed therefor or are very complex or extensive to install. For such requirements, the HEINKEL DRYING AND SEPARATION GROUP has designed an intelligent solution in addition to its BOLZ-SUMMIX portfolio of conical mixers and dryers. The customer-specific, modular working platforms for conical process vessels, such as reactors, orbital arm and screw dryers and conical mixers are secure, fast and easy to install. The platforms consist of a stable aluminum construction, are TÜV certified, CE-compliant and can be reused for many years. Their modular design enables installation via man-way or other vessel nozzles. The individual modules have a low net weight and are easy to handle: The platform is securely fastened with just a few screws. Special rubber pads protect the vessel's wall surface. Upon request, the HEINKEL DRYING AND SEPARATION GROUP provides working platforms with rescue hatches and any type of flaps – tailor-made to meet customer requirements. Additional features such as ladders are also provided.